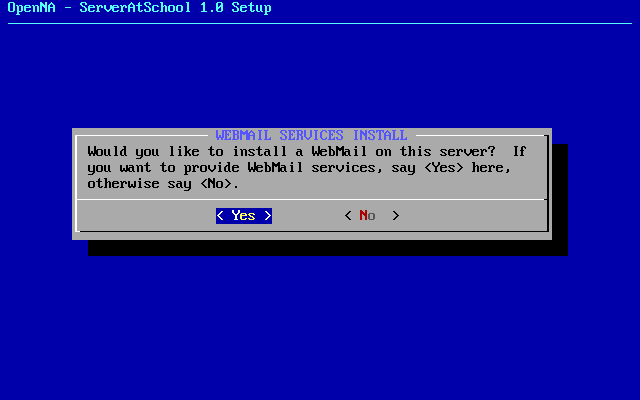 This chapter discusses the installation of optional components for the ServerAtSchool server and shows the final steps of the installation procedure. Installing the Squid proxy server allows you to have tighter control over access to the Internet from within the local area network. Another reason to install this proxy server is to save bandwidth on the Internet connection. The effect of caching files via the proxy is that (static) files like images are downloaded only once. Subsequent requests for the same file will be satisfied from the cache rather than fetching the files again from the original source. This not only saves bandwidth, but also increases performance because the cached copies can be served faster to the clients on the LAN. This can be significant, especially in a school environment where many users (pupils) in turn have to visit the same web pages. On the other hand, if your server hardware has limited amounts of RAM and disk space, you may be better off not installing Squid. This is a classic case of trading performance (processing speed) for storage (memory, disk). Squid is a known memory hog. Press the [Yes] button if you wish to install Squid. If you do so, the following dialogue will be (briefly) displayed to show that Squid is being installed. NOTICE: One of the idiosyncrasies of the proxy server is that messages like grsec: signal 6 sent to /usr/sbin/squid[squid:6347] uid/euid:28/28 gid/egid:28/28, parent /usr/sbin/squid will be displayed on the screen, unless the proxy server is properly configured. You can suppress these messages by stopping the proxy server, using the command 'service squid stop'. Once the configuration of Squid is completed (see section 14. 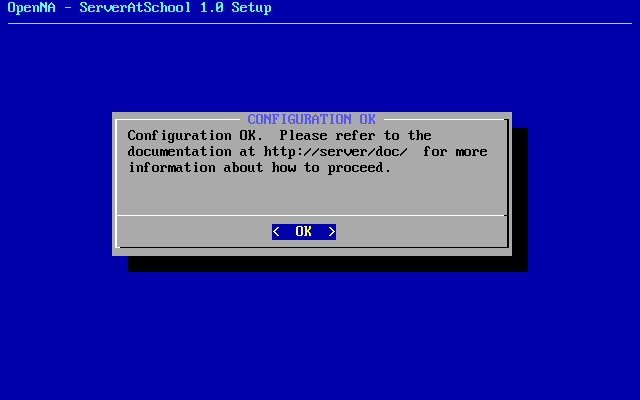 Squid in chapter V. Configuring all ServerAtSchool components), the proxy server can be started again, using the command 'service squid start'. Note that you must be logged on as root before you can stop or start the proxy server. It may sound strange to install a ServerAtSchool server on a laptop, but some 'laptop-features' can be handy on a regular server too. 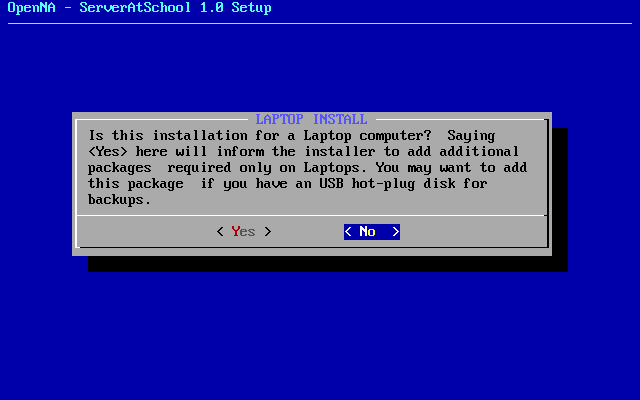 If you say [Yes] here, various USB tools will be installed. The major reason to consider the USB/Laptop packages is the ability to use USB storage devices such as USB hard disks and USB keys, e.g. for backups. A USB connection can serve a (large) disk that can be easily plugged in without bringing the server down. It is a convenient route to copy many files from the server to a disk with a high storage capacity that can subsequently be stored somewhere off-site. A USB key, also known as a USB stick, usually has a somewhat lower storage capacity. It can be used, however, to store important information. An example of important information would be the secret code you use to encrypt your REOBack backups (see the parameter encryptkey in /etc/reoback/reoback.conf in section 11.2 Checking the default ServerAtSchool configuration in chapter V. Configuring all ServerAtSchool components). If your ServerAtSchool server is connected directly to the Internet, you are strongly advised to install the GIPTables Firewall. 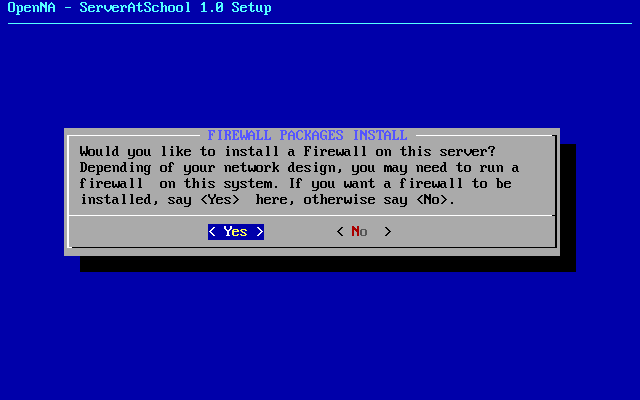 With the firewall you can specify exactly what traffic is allowed to and from your LAN. NOTICE: Even though the firewall is optional, you really should think twice if you are tempted to skip the installation of the firewall. You really, really should install it. There are simply too many Bad Guys out there to not have a firewall. Furthermore, the configuration instructions for almost all subsystems (Exim, Bind, Apache, Samba, DHCP, etc.) in the next chapter assume that the GIPTables Firewall is installed. Please select [Yes]. If you press the [Yes] button, the following dialogue will be briefly displayed. Mailman, the GNU Mailing List Manager, is used for managing electronic mail discussion and e-newsletter lists. Mailman is web-integrated, making it easy for users to manage their accounts and for list owners to administer their lists. Mailman supports built-in archiving, automatic bounce processing, content filtering, digest delivery, spam filters, and more. 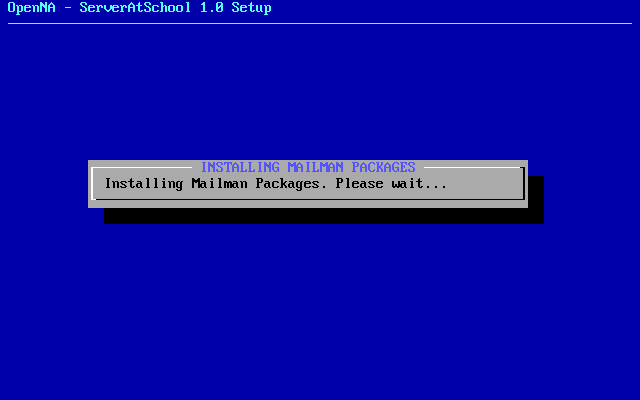 Mailman is free software, distributed under the GNU General Public License. This message tells you that the installation was successful. NOTICE: The dialogue refers to the documentation at http://server/doc/. The ServerAtSchool documentation is installed on the server if you decided to install it in section 8. Documentation in chapter III. Using the text mode installation program. You can use any browser on the LAN connected to the server to read the documentation at that URL. 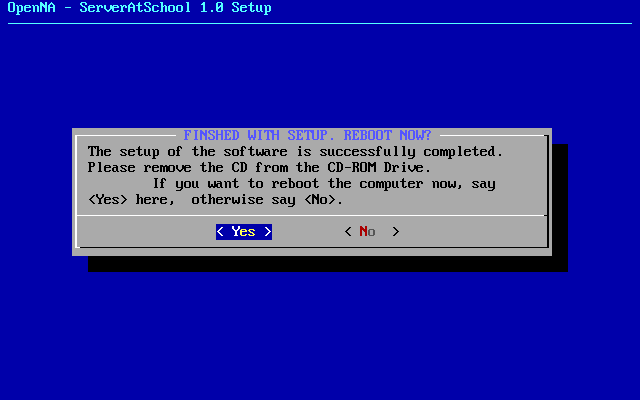 As an alternative, you can read the documentation from the distribution CD-ROM. This completes the basic installation of ServerAtSchool. NOTICE: If you have installed the proxy server Squid, you may find that messages like grsec: signal 6 sent to /usr/sbin/squid[squid:6347] uid/euid:28/28 gid/egid:28/28, parent /usr/sbin/squid will be displayed on the screen. This continues until the proxy server is properly configured. You can suppress these messages by stopping the proxy server, using the command 'service squid stop'. Once the configuration of Squid is completed (see section 14. 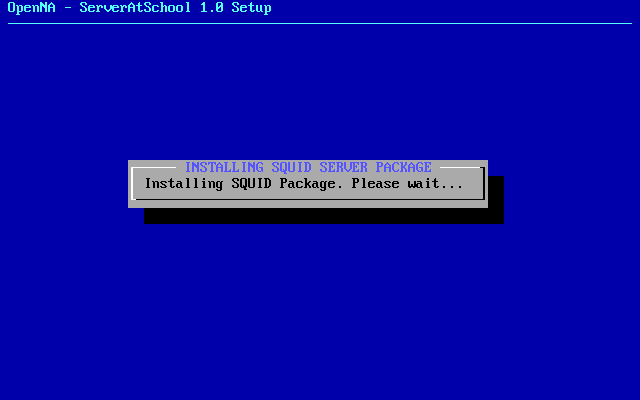 Squid in chapter V. Configuring all ServerAtSchool components), the proxy server can be started again, using the command 'service squid start'. Note that you must be logged on as root before you can stop or start the proxy server. The next chapter takes you through the process of configuring the services and subsystems that you installed.